Longtime readers here at the Jitterbug Cult know that Dorothy Day and Thomas Merton have always been high on my list of faith heroes. The one thing that my faith heroes all had in common that appeals so strongly to me is this: They, like this living Pope, were all about the radical love of Christ. They all were committed peacemakers who incarnated a radical love for the poor and oppressed. (Mother Theresa is obviously another high-ranking faith hero.) They pleaded for mercy and fought for justice for the very people that the radical, rabble-rousing Christ–he who was born homeless in the muck and mire of a barn a long way from any royal palace–anointed with most-favored status. Pope Francis, of course, took on the very name of another hero, St. Francis, largely because of the great saint’s radical love of the poor (and his love of nature and the earth and all of God’s good, green Creation). Here at the blog I frequently lift up my famous faith heroes to you who read it, mindful that this country and the world are full of heroic Christians who slug away every day in obscurity, incarnating the radical love and tender mercies of my Lord and savior. I read an article the other day about a guy called “the Sandwich Man,” whose name is Alan Law, who has fed 700,000 sandwiches to the homeless in Minneapolis. I try to recognize the unsung heroics of Christians like him every chance I get. His kind keep me inspired to do more for the poor and I hope the stories I share of his kind inspire you. Click here for Law’s story. John Wesley: Being a cradle Methodist and ordained United Methodist deacon, I was inspired by Wesley from the time I was given a big dose of him in my Confirmation classes. He loved and served the poor, hated slavery and fought for social justice his whole, long life. He’s the theological “hero” of every devout Methodist Christian who ever was or ever will be. Dorothy Day: I once spent Christmas week at the Houston Catholic Worker, founded by Mark and Louise Zwick–two Catholics who have been doing heroic work for the poor, especially migrants and refugees, for decades. If you want to know more about Dorothy Day and the Catholic Worker faith tradition, explore the Houston Catholic Worker link here. 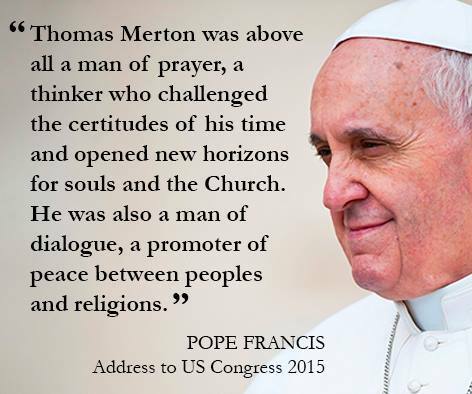 Merton: That the Pope highlighted the lives and work of the American Catholics Day and Merton says a lot about their influence on so many Christians of all tribes, including me. More on My Main Man the Mystic Mr. Merton, as I fondly refer to him, here. The Pope, of course, had much more to say about Dr. King in his visit to a Harlem school. More on that here.